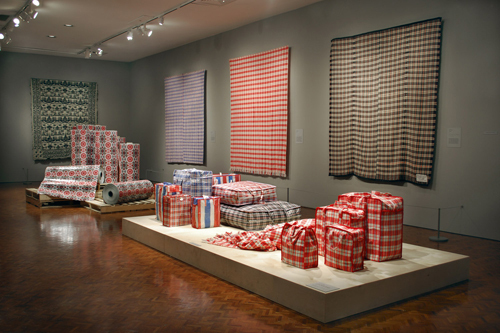 Commissioned by the Columbus Museum of Art, Ohio, Pattern Migration responds to the museum’s extensive collection of 19th century American coverlet (blanket) weavings and entwines multiple production processes to address the friction between globalized factory production and artisanal craft. 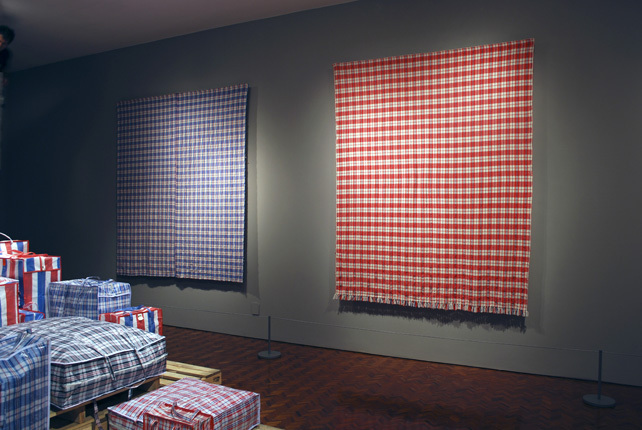 Syjuco, interested in the aesthetic conventions of modern capitalism and consumer goods, worked with three contemporary weavers in the U.S. and in Europe (Peggy Hart, Erika Hanson, and Travis Meinolf) to produce three new textiles that mimic the distinctive plaid pattern that typically adorns cheap, mass-produced plastic travel bags. Subsequently, a set of hand-sewn replica Chinese bags were made from Syjuco’s new woven coverlets, disrupting the divergent areas of high culture and commercial production and reflecting on the history of textile production and anonymous labor and their ever-shifting relationship with the object’s marketplace value. Commonly used around the world, these bags are hallmarks of the globalized spread of objects as well as migrant communities. Finally, working with a Chinese factory, Syjuco produced five kilometers worth of plastic woven fabric, this time embedded with an intricate starburst pattern that was originally developed by a 19th century American weaver. The quantity of the fabric represents the minimum order that could be placed, reflecting the massive scale of factory production today. Visitors to the exhibition were able to take yardage from this fabric and were encouraged to make new “products” with it, thus continuing the cycles of production. Together, the works in Syjuco’s Pattern Migration close the loop between handmade and mass-produced object, forming a strange hybrid of disparate production processes.